Urban challenges created by climate change are a huge problem in Québec; from flood risks caused by heavy rainfall, to banks of snow too heavy to clear from the roads and the gradual toll taken by shoreline erosion. Private companies are beginning to work more and more closely with public authorities to address these issues faced by society as a whole. In Victoriaville, Québec, Gesterra has become a prime example of this kind of partnership. 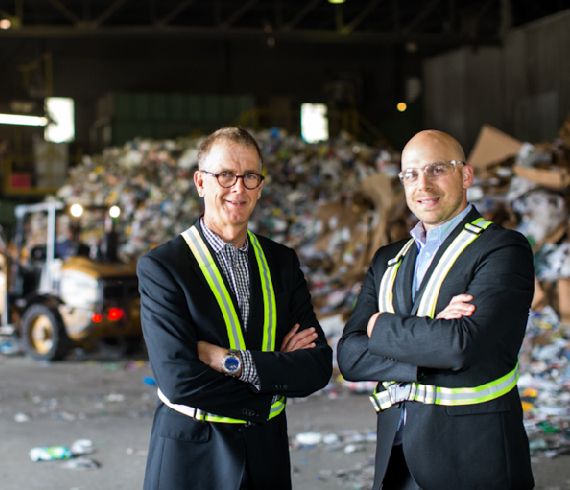 The company is jointly owned by both the regional county municipality (MRC) of Arthabaska – a grouping of 23 municipalities in the Centre-du- Québec region – and Gaudreau Environment, a private firm responsible for residential waste management in the area. A private law had to be adopted in order for such a partnership to form. Ten years since its initial launch, Gesterra is working on a 10-million dollar expansion project for its composting platforms in Saint-Rosaire. “The results are convincing: on average, only 30% of Quebec municipalities collect compost, while in our MRC, the figure is 96%,” says André Bellavance, the mayor of Victoriaville. The company is also carrying out its own R&amp;D in order to ensure that the lowest possible quantity of materials gets sent for burial, and that they are instead given a second life and reused. “Among other examples, we have worked with our supplier, Gaudreau Environment, to create environmentally-friendly decorative tiles out of reused plastic and glass; two materials which are currently difficult to recycle in Québec,” explains Charles Lemieux. This research has resulted in the creation of another company, Regeneration, which now develops and markets these tiles. Even more examples of these public-private partnerships have been appearing throughout Québec. Saint-Hyacinthe, a city found around 50 kilometres from Montréal, is currently using the organic waste collected from residential areas and food businesses in the region to produce natural gas. A winning formula, as the companies involved no longer need to pay for a means of disposing of their waste. From 2017, the city will sell the surplus from the energy produced by natural gas to Gaz Metro. “This will be a significant source of revenue,” says Brigitte Massé, Director of Communications of Saint-Hyacinthe. However, the private sector sometimes feels hindered in its attempts to support the public authorities in their efforts. “Our involvement could be more significant, for example, in the advisory period prior to project commencement, but we would then be prevented from responding to the call for bids,” explains Catherine Roy-Cardin, head of municipal business development for Énergère, a company that provides energy efficiency services for buildings. Nevertheless, the progress being made is plain to see. Certain municipalities have replaced the rule of opting for the lowest price with choosing the bidder that offers the best net present value, which means calculating whether the investment will actually achieve the desired goals. “It’s fairly new for cities, but it’s interesting because we are taking the real impact into account. Therefore, this leaves room for innovation – the rule of opting for the lowest bidder doesn’t support creativity and new ideas, because it means reducing costs as much as possible,” adds Catherine Roy-Cardin. “Businesses that are specialised in the environment usually complain of what represents a problem in their eyes: the complete municipalisation of the environmental services,” says Richard Mineau, CEO of the Council of Environmental Technology Businesses in Québec (CETEQ). In 2015, this organisation created a department specialised in the fight against climate change. A path is now open for both innovation and the private sector to play a role in countering the effects of climate change.